Here you should find answers to the most common questions we receive about the breakdown cover products featured on this website. Yes, some providers have age restrictions. Please refer to our Cover Information Table for more details. No, unfortunately we can only cover trips that originate from the UK (Including Channel Islands) and return to the UK during the period of cover. You should not contact any garage or recovery operator directly. This could invalidate your claim. Age limitations vary depending on the trip length and type of cover. Please refer to our Cover Information Table for more information. No, only UK residents (and residents of the Channel Islands and the Isle of Mann) are eligible to purchase breakdown cover from this website. All policies must be purchased online through our website, we cannot provide quotes or sales over the phone for breakdown policies. Regardless as to whether or not you have kept the Automatic Renewal option, we will always email you at least 28 days in advance of your renewal date advising of your renewal price and what action is required if any. Details of what the policy covers are outlined within the attached documents we send you by email. If you have opted for auto-renewal we will renew your policy unless you advise us not to. Yes, you can change the vehicle you have on cover. We charge a £5.00 fee for any vehicle changes after the 14 day cooling off period. Depending on the vehicle, there also may be an additional premium to pay and typically if you replace your existing vehicle with an older one there'll be a cost. Yes, Some of our providers treat the Channel Islands as part of the UK, so you can get cover with them if your journey starts in the Channel Islands. Please refer to our Cover Information Table for more details. All of our providers cover hire vehicles as long as you have the hirer’s permission and that the vehicle type is one that they would normally cover. See Cover Information Table for more details. You will need a VE103 'vehicle on hire certificate' to show you’re allowed to use a hire vehicle if you’re driving it abroad. Some of our providers will provide assistance for legal costs and expenses in recovering uninsured losses up to the amount shown in the Cover Information Table. All of our providers will cover you on the journey between your home address and your point of international departure from the UK. In addition, some of our providers include ‘cover before you depart’, meaning that if you purchase in advance of a specified short time period of your planned departure and your vehicle is then stolen and not recovered, or an event occurs which means you cannot use your intended vehicle before you travel, alternative arrangements can be made. If you purchase within this specified short time period of your planned departure then the ‘cover before you depart’ section will not apply, however you will still be covered on the single journey between your home and point of exit from the UK. I am going on a single trip, how many days can you provide cover for? How many days am I covered for with Annual multi-trip cover? Our annual products will cover your vehicle for 12 months from the commencement (start) date of your policy. It will also cover you for any number of round trips in that year, provided each trip isn't Longer than the maximum permitted duration offered by your policy. So if your policy covers trips up to 30 days, you can take as many trips in that year as you like, as long as no one trip is more than 30 days long. This will usually be measured by asking for proof of the departing and returning tickets across the channel. For trip duration limits, please refer to our Cover Information Table. Are there any weight or size limits for my vehicle? Yes, there will be a restriction on the maximum weight, length, height and width of your vehicle. Please refer to our Cover Information Table for more details. You are covered throughout the UK and/or mainland Europe, as defined in your policy or service agreement schedule. Unless you select Allianz ‘Zone 1 only’, all of our providers offer cover in at least the following countries: Andorra, Austria, Belgium, Bulgaria, Canary Isles, Czech Republic, Denmark, Estonia, Finland, France, Germany, Gibraltar, Greece, Hungary, Italy, Latvia, Liechtenstein, Lithuania, Luxembourg, Monaco, Netherlands, Norway, Poland, Portugal, Republic of Ireland, Romania, San Marino, Slovakia, Slovenia, Spain, Sweden and Switzerland. 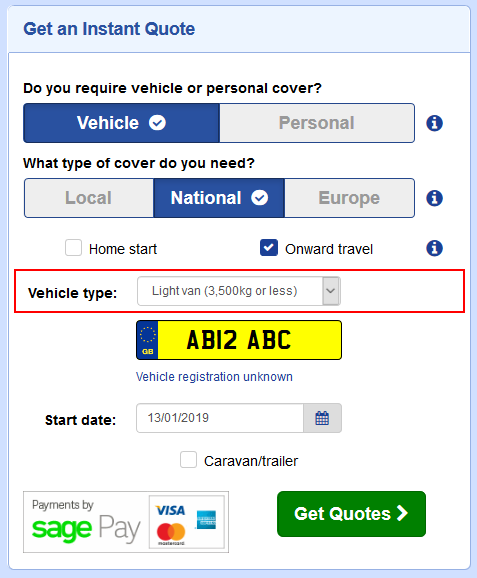 By entering your vehicle's details in the Instant Quote Engine (see image below), you'll only see the cover providers that will work with your vehicle. That said, you still need to make sure that your vehicle meets all of the requirements in terms of size (as we can't currently determine this from your reg.). All of our providers can cover cars up to 3500kg, and some of our providers can also cover motorcycles, motorised caravans and light vans. Other vehicles may be supported by our providers individually. If you have a policy with Emergency Assist and have broken down, please call them on 0330 320 4548. Please note: The above numbers are for CLAIMS Only. For anything else, use the contact us form. England, Scotland, Northern Ireland and Wales. 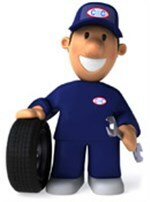 PEX have a network of garages across these areas, in the event of a breakdown please call them on 0330 320 0890. Please note: The above numbers are for CLAIMS Only. For anything else, please use the contact us form. (for residents only) Jersey and Guernsey. Customers with a Silver or Gold policy have National recovery and are covered for travel England, Scotland, Wales, Northern Ireland, the Channel Islands and the Isle of Man. For customers with a Zone 1 policy, Belgium, France, Luxembourg, Netherlands and Republic of Ireland are covered within this policy.